For years garlic was on my hit list to become a mass producing crop in my food garden. After failing miserably season after season I gave up, tail between legs it was all over. Learning how to grow garlic in Australia was quickly disappearing. 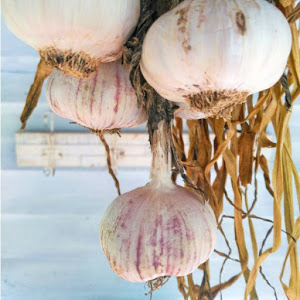 It wasn’t until I hooked up with a local organic garlic grower here in the Hunter Valley of NSW, that I discovered the true secrets to growing garlic. With her hubby, Amber Sheedy owns and operates Hunter Valley Produce. 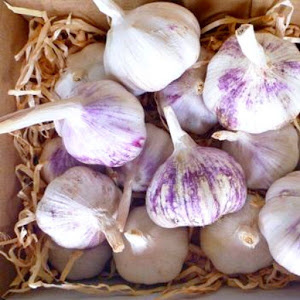 They specialise in Organic Monaro Purple Garlic which is from the Turban group. In Australia, there are over 100 cultivars of garlic and they respond differently depending on the climate. This includes more than just temperature. It’s definitely not as easy as sticking a bulb in the ground which you bought from a supermarket that’s for sure. Believe me, I tried that and it doesn’t work. Because it’s so important to grow the right garlic for your climate, it pays to do your research. You definitely want your crop to reach its full potential and love where it grows. There is nothing worse than failing right at the end, so it’s important to choose well. You’ve also got to ensure you purchase high-quality seed (which are the cloves) free of disease. It’s best to get your seed from a grower, not the supermarket. 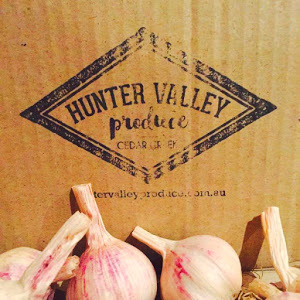 Luckily this was an easy selection for us with our box of Organic Monaro Purple Garlic arriving directly from Amber’s farm. This variant loves the cold winters but isn’t as fussed on humidity. The number one rule is soil preparation. Spending time preparing your soil is vital. Your soil needs to be quite loamy, which means rich, dark, light and fluffy. The soil needs to be well composted and have good drainage. If you don’t get this right, you’re not going to get bulb development. The trick here is not to crack your garlic too early. Garlic is a living organism so once you crack it will start to sprout. Another awesome tip is the night before you put your seed in the ground, soak it in a mix of bicarb soda and water. Just a teaspoon or two and this will ensure the cloves are free of disease. Only plant your best cloves and make sure you choose a sunny position. We like to plant garlic around March-April on a new moon; however, this will depend on the cultivar you choose for your climate. Moon planting makes perfect sense once you understand the science behind it. The best way to conceptualise moon planting is to think about the gravitational forces between the sun, moon & earth. They all affect the ocean’s tide which is a massive body of water. Well, the same concept applies to plants. 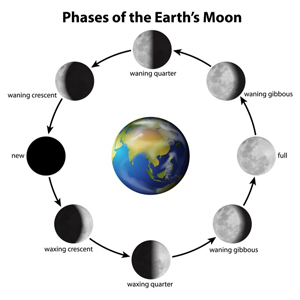 Because the moon has this enormous effect on water movement it can also affect the water absorption process of seeds, seedlings and plants and the way they germinate and grows. Pick the new moon to plant your garlic seed because this is when the sap rises (water absorption as well) and an increase in energy has been recorded in plants. You could see strong results during germination giving your organic garlic the best start to the season. You need to make sure the bottom of the clove is facing down but garlic is very smart, if you get it wrong don’t worry. Some grower’s plant by tractors and the bulbs still form. When you’re planting you need to give the seed space to grow perfectly. Ideally, you want the spacing to be 20cm x 20cm apart. This is especially relevant to the humid climates so the seed can breathe. Dryer areas may be able to reduce this spacing. To ensure your bulb is completely covered, sow at a depth of 4-5cm into the soil. Once you have planted your seed, water them in and give them a really good cover of mulch. Your bulbs will easily grow up through the mulch. They will need at least 6 hours of winter sun a day and make sure the bulbs are completely mulched as they grow. If you want to ensure your soil drains well, you can mound the soil before planting. This will help if your climate has a wet season over winter. If you plant your garlic March – April it will be ready for harvesting October-November. During this time make sure your bulbs don’t dry out, but don’t overdo the watering because garlic doesn’t like wet feet. Garlic doesn’t like competition either, so remove any weeds that show up and want to start a party. Another good tip is if you find any rotting bulbs during the growing time or at the end when harvesting, remove them because the disease will spread. This is an exciting time for garlic. One of our group members once described it like being in the last two weeks of pregnancy. You just have to wait and watch for the signs. As you approach the end of the growing period, you may notice what’s called ‘scapes’ coming from the centre of the bulb. This is the flower and can indicate your bulbs are nearly ready for harvest. If your bulbs are too small still, simply cut the scape back and the energy will be redirected back into growing the bulbs larger. Some varieties need to be harvested after the flower opens, so learning about your cultivar is vital to your garlic’s success. Another sign you can identify is the bottom leaves will start to die back. When you have 4-6 leaves left, this is a good time to pull them out. 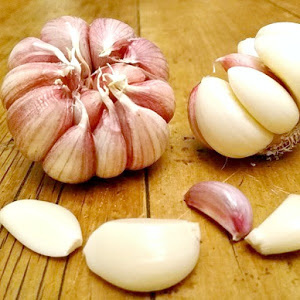 Once you pull your garlic, you can leave it lying next to its growing spot on the ground overnight. The next day it’s time to collect them all and hang them up in a well-ventilated place out of the sun. If you live in a humid climate, you can cut the roots off at the bottom which will improve the drying process for you. You got them this far, you don’t want them to rot now. You can plate them, bunch them with twine or hang them individually. It doesn’t really matter because it’s the drying process not what it looks like. I’ve never been good at braiding hair. Drying time will range from between 4-6 weeks. The good news is that you can’t over dry your garlic…phew. You can also peel any thick outer layers. This won’t affect your bulbs it actually helps with drying time. If you need some more drying time, try turning them upside down on a wire rack or in chicken wire for ventilation and remove the roots, if you haven’t done this earlier. Depending on your situation you may want to cut the leaves off at this point as well leaving about 4cm on the neck. Select the bulbs you want to save and sow next season and store them in a well-ventilated place. Make sure none of the bulbs are soft, because that’s rot, and it will impact the rest of the bulbs. Once you have a successful season, you’ll be ready to save your seed and do it all over again because it really is easy once you know how. Leave a comment below if you have a question or story to tell. We love hearing how everyone is growing.